There is finally a forecast with some good news to share regarding Hurricane Irene. Today, Irene weakened a little more than was previously expected, and the latest forecast shows a storm that continues weakening. The latest National Hurricane Center forecast (5 pm) calls for the center of Irene to pass very close to the Jersey shore as a weaker Category 1 Hurricane (75 mph winds) and make landfall around the eastern side of NYC at about 10 AM on Sunday August 28th. The forecast at nearly two days lead time is still highly uncertain, with individual model predictions ranging from landfall at the Pennsylvania border to Cape Cod. 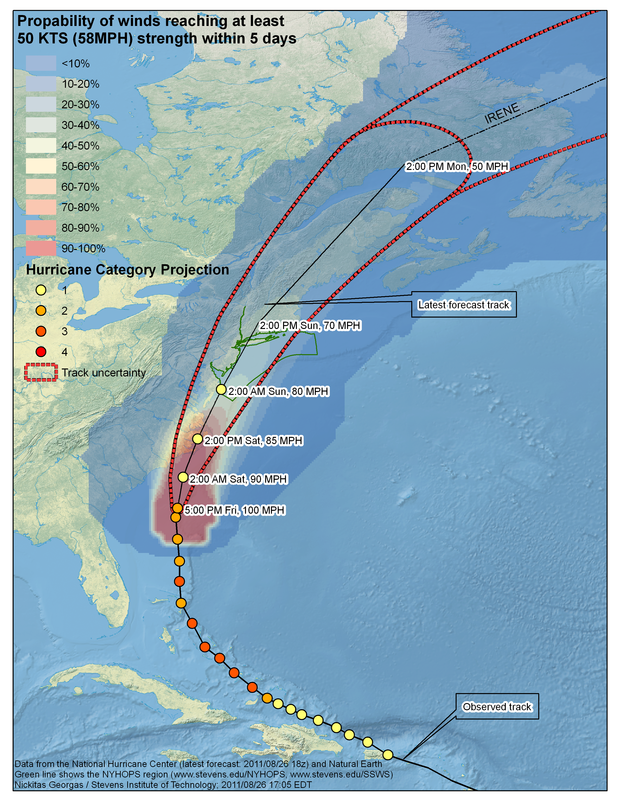 NHC forecast track for Hurricane Irene, including probabilities of dangerous 58 mph steady winds. Our NYHOPS/SSWS domain is superimposed with a green border. Courtesy of Dr. Nickitas Georgas. We can now say almost definitively that this will not be a storm like that of 1821, as it is definitely weaker. That storm was Cat-5 when it went over the Outer Banks, and I believe a Cat-3 at Cape May. While it has a similar track, it is definitely going to be weaker, as significant strengthening is unlikely from here over cooler waters. NHC now lists the chances of NYC getting very dangerous 58+ mph steady winds at about 20%, and the chances of having hurricane force (74+ mph) winds BELOW 5%. However, the deadliest part of a hurricane is typically its storm surge, and even if the eye doesn’t hit NYC, we could still see our worst storm surge in over 100 years. NOAA’s storm surge model (P-SURGE) is providing useful information in their 3 day forecast for our area, listing the probability of a 4 foot or greater storm surge at only about 20%. Depending on the timing with high or low tide, this water level could lead to overtopping of seawalls around the New York City inland waterways, and flooding of low-lying infrastructure (subways, PATH train, tunnels, FDR highway, etc.). They list the probability of a devastating 8+ foot surge at 5-10%. Stevens Institute’s two-day advance forecasts of storm surge, as well as waves and currents for NYC, NJ, Long Island waterways, are posted at about 1:30 AM daily, so look for them Saturday morning to give highly detailed forecasts for Irene’s Sunday impacts. The passage of Irene at 10 AM on the 28th is two hours after a moderately high tide (8:00 AM), but not the higher evening tide that was feared, so things could be worse. 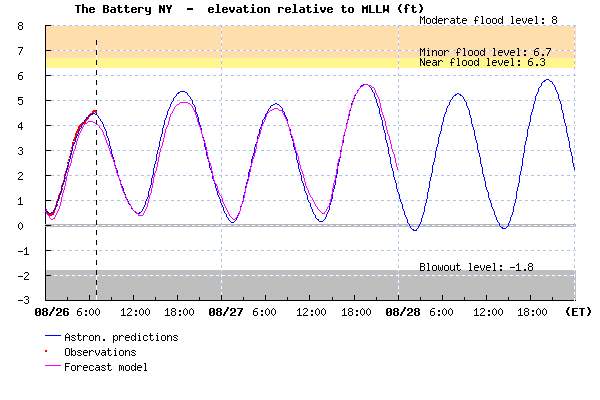 Predicted Tide (blue), observations (red dots) and SSWS water elevation forecast (magenta) at The Battery, New York City, for Saturday and Sunday August 26-28. High tides along Long Island are at a similar time, and along the Jersey Shore are about one hour earlier. The National Weather Service and local Offices of Emergency Management (NJ, NYC, Nassau and Suffolk counties) have begun evacuating some low lying areas and are urging people to begin to make preparations for the storm. Their websites also have useful information on hurricane preparation. This entry was posted in water, weather and tagged 1821, flooding, forecast, hurricane, Irene, landfall, long island, new jersey, New York City, spring tide, tide, tropical, wave. Bookmark the permalink.